It is a delight for my wife, Joan, and me to join you here this evening in such august surroundings, redolent as they are of the history of medicine in Ireland, and I am most grateful, Chancellor Maurice Manning, for the honour that you and National University of Ireland do me by your invitation to deliver the 2018 Dr Garret Fitzgerald Lecture in the presence of such distinguished guests and, especially, members of the Fitzgerald family. I am also grateful to my old friend Senator Michael McDowell for agreeing to give a response to my lecture afterwards. In the mid-1980s, along with Mary Pyle, whose husband Fergus was sometime Northern Editor of the Irish Times, and others including Michael Fitzgerald, Kate Nowlan, Ellen O’Malley-Dunlop and Ross Skelton, we set up the Irish Forum for Psychoanalytic Psychotherapy. We met regularly at Mary and Fergus’s home on the Palmerston Road, just next door to Garret and Joan Fitzgerald. It was around 1986/87 when he was Taoiseach and I was astonished to find that outside his house stood one single, very relaxed looking, member of the Garda Siochana, who seemed quite unconcerned that I was parking my Northern registered car just across the road from the Taoiseach’s home. It was a striking contrast with the security measures we were used to in Belfast. Every significant public figure had substantial protection arrangements in place – my wife, Joan, and I lived next door to RUC HQ in East Belfast and so were used to a rather more substantial police presence than was apparent outside the Fitzgerald’s home on the Palmerston Road in Dublin. However, despite living in another part of the island of Ireland which was worlds away in its atmosphere and politics, Garret Fitzgerald was persistently concerned about the North, describing his great aim as the creation of a pluralist Ireland where the Northern Protestants of his mother Mabel’s family tradition as well as the Southern Catholics of his father Desmond Fitzgerald’s family, would feel equally at home. It was not only that fervent commitment to a tolerant future, but also his thorough-going liberalism and his preparedness to confront traditional conservatism that attracted people like me in the North, as well of course as so many young people here in the South, to his him and his politics, and it was during those years that the relationship between Fine Gael and the Alliance Party became very strong indeed. He was in addition a deeply committed European, fluent in French and acquainted with continental thinking. Roy Jenkins, later President of the European Commission, the best Prime Minister the UK never had, and the Leader of the Liberal Democrats when I went to the Lords in 1996, paid Garret Fitzgerald what was in his terms one of the highest compliments possible. After hearing Garret speak at the opening of the European Parliament he said of him “There, I thought, spoke the Ireland of Joyce and Synge and the Countess Markicwiez. It was he who made me feel provincial.” How could I not be attracted to this great Irish leader, committed as I was to reaching across the community divisions and building a genuinely liberal and pluralist Ireland, with close relations with Britain and in the wider European context. I have always been a fervent European. It is an emotional thing as much as an intellectual one. My parents took our family travelling in every country this side of the Iron Curtain as youngsters and from an early stage I was involved in European networks in personal, religious and political life. Both of our daughters-in-law are from outside of the UK and our most of our grandchildren are growing up bilingual, some in English and German; others in English and Portuguese. My wife and I make our home not just in the United Kingdom but also in France. As a former vice-president of the European Liberal Democrat and Reform Party and someone always committed to Europe, it is not just personal, but political. Intellectually too, the principles behind the European project have been a driving force in my understanding of a better way of doing politics, particularly, of course, in my own part of the world, in Northern Ireland. The border between the North and South in Ireland is currently, as it always has been, something of a problem, but it is not itself the cause of our problems. It reflected problems that were there long before, though it did exacerbate them. However, the way that the European project worked in its earlier years provided my generation with inspiration and with a model that enabled us to work to change community relationships within Northern Ireland, between North and South, and between Britain and Ireland. Indeed the three-stranded talks process that emerged from the consideration of these three sets of relationships was the most important discovery of the Irish Peace Process – a realization that is applicable to other areas of conflict – that our problems were a result of disturbed, historic relationships, and their resolution was to be found, not only in better institutions, changed constitutions, recognizing everyone’s human rights, improving the economy, and the transformation of policing and the administration of justice, but, fundamentally, in addressing intercommunal relationships. It was not just about the linearity of better regulation but about engaging with the complexity of better relationships between and among the various large groups or communities of which we are members. We came to appreciate the importance of process in achieving understanding, of inclusivity in reaching sustainable agreements, of the slow evolution of new forms of self-governance and of the building of a structured network of relations. All of this emerged not only from the history of previous failed attempts at bringing peace to Ireland but from the success of the post-war European project in which France, Germany and the others first began to cooperate over coal and steel, rather than using them to make the weapons of war with which they had wreaked such havoc on each other twice in a generation. The way they had worked creatively and flexibly in those early days to share sovereignty and invent new ways of governing was a model for us of how things could be – new structures, new laws, new levels of cross-border cooperation but most importantly new relationships resulting in new levels of prosperity and a better life for all. As the progress being made in South Africa and the Middle East in the 1990s helped us see that political conflict and violence did not have to remain intractable, so Europe at the same time helped us to see how that could be done. However, for me, sadly, it was neither entirely a shock nor a surprise when the UK’s Brexit Referendum went the way it did. For some years I had been warning friends and colleagues that the project was not going well and, unless those of us who are pro-European were able to persuade our colleagues in Brussels to change the way that the European Union was developing, ​we would find those opposed to the Union increasing in number and in fervour, and it would not be good for the project—indeed, it would be destined for disaster if there was no change. I said so in speeches in Westminster on a number of occasions but there was not a preparedness to listen. It was a common trajectory. What starts with inspiration, novelty, creativity and flexibility in one generation, hardens down to legalism, regulation and conservatism a generation or two later – and so it has been with the European Project. It started as a peace project with the determination of Jean Monnet, Konrad Adenauer, Robert Schuman and others to use coal and steel as the foundation for the subsequent political cooperation that would make war unthinkable. It was not about the euro or the single market, and it was not about providing a space at the top table of global affairs for Presidents and Prime Ministers of small European countries. It was a peace project to try to make sure that Germany and France and the rest of us in Europe did not go to war again. Now, tragically, the project itself has become the focus of division, not only within the United Kingdom, but right across Europe. Pro-EU Europeans should have been looking for a long time at why things were going wrong. If a couple get divorced after 40 or more years together, and the one who leaves does not do so in order to go to another partner, the one who is left needs to ask themselves some serious questions about the motivation for the divorce after such a long time. There was clearly a problem of a serious order in the relationship. What went wrong in Europe? I believe that the answer is that the European Union was not built on liberal principles of freedom, flexibility, organic growth and development, with appropriate and meaningful sensitivity to differences of identity and culture right across Europe, not only between Northern and Southern Europe, but between East and West too. Instead, it was centralising and focused on itself and on the interests, concerns, preoccupations and beliefs of the elite, with the result that many ordinary people found themselves becoming disenchanted. This is a disaster. We know what happens when Europe becomes divided, but divided it has become, and our job now is to try to find a way of bringing it together. The move to Brexit has made this an immediate problem for all of us in Ireland. But before turning to what can be done it may be useful to say a few more things about why Brexit is coming about. There has been a lot of foolish chatter about Britain seeking to turn the clock back to the glory days of empire, but those who voted for Brexit are no more eager to have immigrants come from the countries of the former empire than from the rest of Europe. There is indeed good reason to look to history, but we need to go further back. Brexit has been with us before. Almost 500 hundred years ago Henry VIII took the church in England out of the centralized community of Western Christendom, risking not just economic disaster, but hell fire for ever. There were many more things involved in that breach than ending his marriage to Catherine of Aragon. In addition to the general religious foment of the time and people bridling at being subject to rules and regulations imposed by religious authorities seen as corrupt and distant, there was something of the wish for independence common in many an island nation – a sense and sentiment not unknown in this island. Britain joined the European Economic Community on 1 January 1973 (on the same day as Ireland) for economic reasons and never entirely subscribed to the political dynamic of the EU. When those political ambitions seemed to be jeopardizing the capacity of British people to decide about their own future and identity as a nation state, they were into territory that some of my colleagues call ‘sacred values’. All of these emotional issues – the sense of independence, the concern about national identity and integrity, the wish to be accorded respect and be treated fairly – were all felt to be under threat, a view that was profoundly confirmed when just after the referendum, the President of the European Commission, Mr Jean-Claude Juncker, demanded that Britain implement Article 50 straightaway, saying that it was a requirement. It was not a requirement, but it was an extremely unhelpful intervention because it gave precisely the impression, of arrogant and insensitive Brussels talking down to everybody, that had produced the problems in the first place. It is important to note at this point that, as in any situation of conflict, we ought not to try to justify one side or the other, but to try to understand why we have such a deterioration in relationships and what to do about it. Relationships are more than even a two-way affair; they are complex and involve a whole network. In addition to structure and boundaries, we must be prepared for flexibility if relationships are to evolve, and even survive. It may be too late to do other than have a relationship where the United Kingdom is outside the European Union, but it is not yet too late for some of the other countries, because this is not just a question of Britain. Many other countries are asking themselves similar questions and have deeply dissatisfied populations, and this year we have seen some developments of a thoroughly untoward order, for example in Italy and Spain in the south and in Hungary and Poland in the east of Europe. When it comes to the border in Ireland, I had hoped that leaders in London, Dublin and Brussels would come to understand that it is in all our interests to be flexible and creative and not simply say, “Well, take it or leave it. If you want to do Brexit, here are the consequences”. I sometimes feel that if those engaged in the current negotiations in London, Dublin and especially Brussels had been in Belfast 20 years ago, we would never have had the Good Friday Agreement, because it required us to go way beyond the normal rules and procedures. What then, should be done? Instead of immediately rushing to find practical solutions we should focus on the question of relationships. Those three sets of relationships that I mentioned – between the two main communities in Northern Ireland, between North and South in Ireland and between Britain and Ireland, were held and supported by the external relationships within the EU and with the USA, which have special relationships with both Britain and Ireland. Now all five sets of relationships are in difficulty. The USA is enmeshed in problems of internal and external relationships and the EU is experiencing its own difficulties. More immediately for us the British and Irish Governments have not been focussing sufficiently on their important relationship with each other. The leaders of both countries need to realize that Ireland is not merely ‘one of the 27’. There is a very special relationship, with the common travel area and the acceptance of citizenship and the right to vote being only a few of the examples of that special relationship. In all of history, when Britain has disregarded the importance of Ireland, or Ireland has sought out relationships with other parts of Europe in preference, it has never ended well for either. In the Westminster Parliament I have repeatedly warned the British Government that they need to pay more attention to the relationship with Ireland. I remember in 2013 when the then Crime and Courts Bill was being debated, I realised that problems were emerging in Northern Ireland over the question of whether there would be a legislative consent motion in the Assembly. I therefore met with Lord Taylor of Holbeach, who was responsible for the Bill in the House of Lords. I asked him, “Has the Right Honourable Theresa May”— who at that stage was Home Secretary —“had a consultation with the Minister for Justice in the Republic of Ireland, because the NCA, which is going to be created by this Bill, has border security as one of its fundamental requirements? That is one of the things it is about. The only land border we have in the United Kingdom is with the Republic of Ireland. We have a British-Irish Council. We have a whole series of international agreements. We have meetings of Ministers in every context. Has the Home Secretary consulted the Minister for Justice in the Republic of Ireland about this question?”. The Lord Taylor of Holbeach, who is a very honest and open man, was clear. It had not even entered their minds to have such a conversation. It had not even entered their minds! It was not nastiness. It was not malevolence. It was not meant as a snub or a dismissal. It just had not even entered their minds. It reminded me of the response I received from an old friend who used to run the CIA. I asked him if the USA had consulted with India prior to invading Afghanistan, after all, India has always been just next door to Afghanistan, it has a million men under arms, and is an ally of the West. “We never thought of it,” he said. What a disaster, that they never thought of it. My fear is that Theresa May has brought to the office of the Prime Minister many of the attitudes, the people and the approaches of the Home Office, and in the case of relationships with Ireland, North and South, that creates endless problems for her and for all of us. That is why I appealed publicly for her to understand that being Prime Minister of the United Kingdom is not just about being Prime Minister of England and a few add-on bits. It is about Scotland; it is about Wales; it is about Northern Ireland; and it is about many parts of England that do not necessarily feel entirely at home with the approaches that are taken in London. That entails a stretching of imagination and political creativity, it means engaging with people and while not entirely easy, it is essential in creating the right kind of environment within the United Kingdom and in relationships within and beyond the EU, but especially with Ireland. But I must also say here in Dublin that to be seen siding with the rest of the EU against Britain is not a recipe for success. England’s difficulty is likely to be Ireland’s difficulty rather than Ireland’s opportunity. This is especially true of economic relationships. 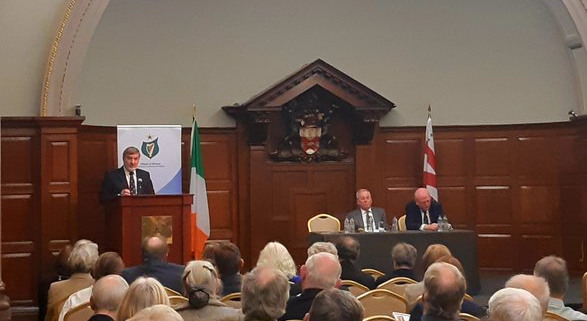 A great deal has been said about the economic consequences of Brexit given the border between North and South, and this is indeed significant, but it is paltry in comparison with the amount of trade between Dun Laoghaire and Holyhead. Even after a hundred years of independence there is a huge linkage between the two islands and it has received a great deal less public attention than it needs and deserves. Indeed, as I told the committee of the Seanad addressing Brexit, if agriculture and the agri-food business, along with energy (especially electricity) were removed from the equation through a bilateral arrangement that London and Dublin agreed and took together to Brussels, much of the border problem, such as it is, would be addressed. The east-west trade issue is a much more complex and difficult one and I hope that it is receiving more attention behind closed doors than is evident to date in the public space. Whether or not that is the case, of one thing I am certain, a great deal needs to be done by both sides to rebuild the relationship between London and Dublin. Ireland has a long history of looking in vain to Europe to help them against England. It would be much better to act as a bridge between the UK and Europe, than as a bulwark for Europe against Brexit Britain. Garret Fitzgerald realized this. You will recall that after his work with the New Ireland Forum elicited the notorious “Out! Out! Out!” response from Margaret Thatcher in 1983, he and the Irish diplomatic service did not attack back, but instead persisted in a positive engagement with London and the result was the 1985 Anglo-Irish Agreement – a watershed in British-Irish relations and a testament to Garret Fitzgerald’s steady work of relationship-building with Britain. Unfortunately, while he kept the SDLP informed, the British Government not only failed to keep Unionists and Alliance informed, but purposely misled them, with disastrous consequences. In addition to the East-West relationship, the two other important sets of relationships – within Northern Ireland and between North and South – have also suffered much in recent times. There have been various reasons for this, not the least being the divergence in view about the Good Friday Agreement. For Unionists it was a settlement – an end of violence in return for fundamental changes in political structures, policing and the administration of justice, and inclusivity of Irish culture. For Republicans however it was regarded as a vehicle that would facilitate moves towards a United Ireland. While Ian Paisley and Martin Maguinness understood what had to be done and gave leadership during their time as First Minister and Deputy First Minister, the divergence between the perspectives of their party members and especially the generation that followed them, ensured that the Assembly and Executive in the North never truly settled into a solid working relationship, and the various recent problems over accusations of corruption, as well as the disrespectful behaviour of some senior members of the DUP led to Sinn Fein walking out and bringing down the Executive. Attempts to repair that relationship will require more focus and sense of responsibility from the leadership of the two parties than we have seen to date. Sinn Fein currently seems more focussed on its prospects south of the border and the DUP remain new-fangled with their significance at Westminster. These preoccupations will pass, but the need to find a way of living together in the North will not. The North/South relationship too will only work when unionists feel that the Dublin Government is not going to use Brexit to press towards Irish unity, and at the moment that is how the position of siding with the rest of the 27 against the UK is perceived – again a problem of relationships returning us to the suspicions of the past rather than building on the principles of the Irish Peace Process. Garret Fitzgerald understood this very well. For many years after his time as Taoiseach he wrote a weekly column in the Irish Times, and in his contribution to Ireland’s newspaper of record on 25 February 2006 he wrote about how history would judge those who mismanaged relationships in these islands. He said that he doubted that any of the players would emerged unscathed. Unionist Governments in the North had alienated what was then a 35 percent Nationalist minority; the British Government had abandoned their responsibilities; and successive Irish Governments had actually heightened tensions within the North. He saved his fiercest criticism for the IRA, whose campaign of violence he regarded as morally reprehensible. They had, he said, actually wrecked the prospect of Irish unity by creating a massive divergence, economic as well as political, between North and South. But let me quote from a section near the end of the column. “Simultaneously with the demise of the Cold War having finally eliminated any strategic British interest in Northern Ireland, Britain’s primary concern was now also the restoration of peace and stability in the North. We are of course part of a wider world where relationships are uncertain, and anxiety is high, as a consequence of globalization, new disruptive technologies, the financial crisis, the dizzying pace of societal change and the collapse of the old post-war structures and alliances. However as was the case many centuries ago when Europe was in dark times and Ireland sent out the message of hope to the rest of Europe, we have a chance, given our experience of the Irish Peace Process to contribute something really important to wider political understandings, but only if we are able to return to implementing what we said we had agreed in the Good Friday Agreement twenty years ago. 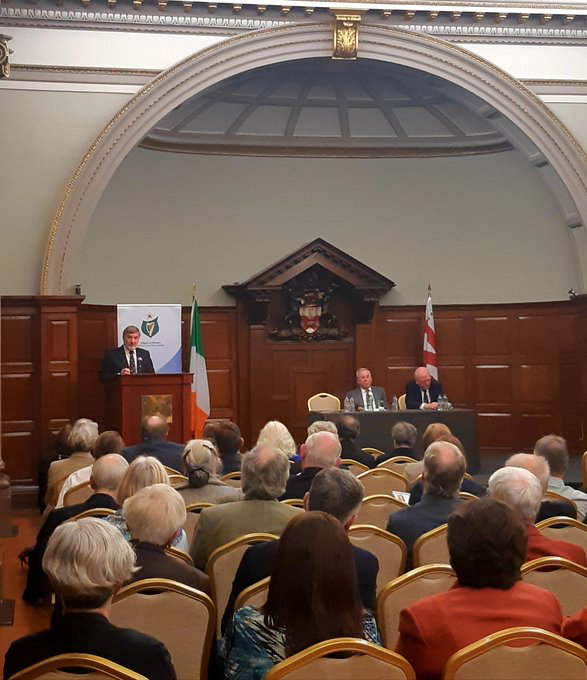 The origin of our problems and the healing of our divisions is to be found, as Garret Fitzgerald pointed out, in addressing our historic community relationships. I believe that we can do that, and for the sake of all our children and grandchildren, I believe that we must.